You know that blockchain, the cloud-based distributed ledger, is one of the hottest emerging business technologies. You’ve seen it on newspapers, magazines, social media; literally everywhere. It is “one of the most overhyped technologies ever,” according to noted economist Nouriel Roubini. Still confused if your company needs to create or join a blockchain application? 1. Are we ready to start a blockchain initiative that covers an industry or even multiple industries? 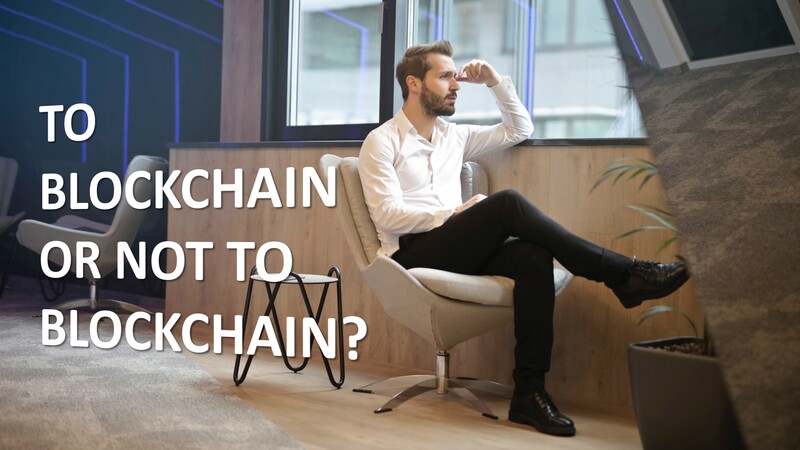 Blockchains bring a shared, immutable, secure record of transactions across a business network, so boarding on a blockchain project will be beyond your own organization or business’ purview— “going big,” so to speak. For example, a contract between two or three parties could be executed on the blockchain. Instead of numerous paper copies being updated with the latest terms, a single document, which tracks all the changes made by different parties, would suffice. The contract would be executed once all parties had met certain conditions. 2. Do we want to create or join a business network to improve the business process? Starting or joining a blockchain network is not about you anymore. You must rely on others to produce and verify business results. Let’s say you own a solar design company. When you enlist preferred vendors and other industry players into a blockchain-based energy platform, you can get work done more efficiently. How? By sharing one set of validated specifications across the delivery cycle, from sale to finished installation. Customers are more satisfied because they can now follow the project stages as they progress. 3. Do we need to verify a digital or physical asset across our business network? In such cases, you’ll need trusted sources in your business network to audit and authenticate the physical asset, which can be tricky. 4. Can our business or industry processes benefit from faster automated processing or payment? Some contracts require parties from across an industry to conform to established rules or specifications. The process could be improved considerably, and payments could be made quickly if all trusted parties in the blockchain could see a log of all transactions that occurred which meet the contractual specs. Blockchain technology is particularly suited for automating “smart” digital contracts among more than two parties. 5. Do we trust the participants in our blockchain to regularly participate in good faith or do we need to give incentives? For example, two food distributors in Italy are creating a blockchain ecosystem of more than 500 organic suppliers to authenticate and certify the origin of certain foods. In this case, product authentication and process consistency rely upon the people and organizations enrolled in the blockchain. In some blockchains, you may want to consider using tokens—a form of digital currency for payment or work performed—to incentivize and reward participation. Get a professional consultation to answer these 5 questions accurately. Contact us. These five guiding questions is only the first step of your venture into the blockchain landscape. If the majority of your answers is YES, the next step is to learn about the process every blockchain businesses will go through. Businesses that adopt blockchain will encounter different challenges from traditional or even online business models. Get prepared by anticipating the 5 obstacles every blockchain business faces. Lisa M. Schwartz, 2018. 5 Easy Ways To Determine If Your Company Needs Blockchain [online]. Available from: https://www.forbes.com/sites/oracle/2018/09/25/5-easy-ways-to-determine-if-your-company-needs-blockchain/#64fd7e474aaa [Accessed 17 October 2018]. P.S. Like our Facebook page!